HI Maggie. That is a beautiful pink mosaic. The weather here has been bad as well and like you I am going through my photo's.I have so many new ones from our trip . I love going through them again and see all the places we visited.Happy pink Saturday. PS I put you on my Give-away list with three numbers. Thank you, Maggie - I love a good recommendation. Right now I'm reading The Postmistress. Have you read it? Your collection of pink is heavenly. Happy Pink Saturday! Such a petty mosaic! I hope you enjoy reading Water for Elephants. I loved it! The flowers are just beautiful, Maggie!! What a pretty mosaic! I have Water For Elephants but haven't read it yet. Let me know what you think of it. I am finishing up a drugstore paperback and really enjoying it. I have to quit blogging now as the end is calling to me! Beautiful collage with great color. Lovely collage, flowers and colours! Love your mosaic, Maggie. 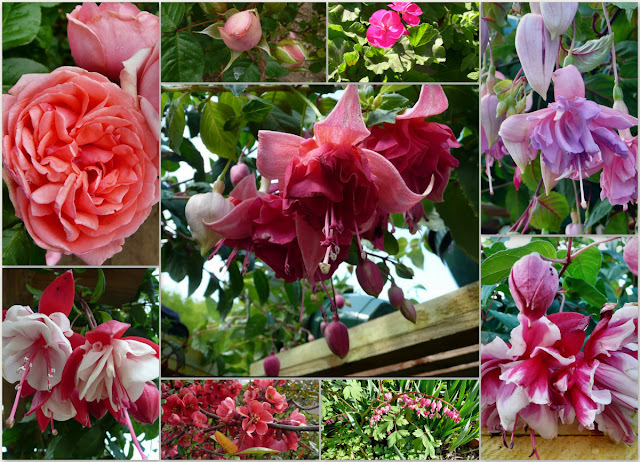 The fuschia's are exquisite. Love, love, love the pink flowers! You pink mosaic is lovely. We have been having very hot weather and watering every day. This coming week should get back to normal. Enjoy your books. The flowers are gorgeous. Happy PS! Hi Maggie, found you through Pink Saturday..what beautiful gardens and will enjoy getting to know more about you and your lovely France!